They wanted to execute them one by one, but the couple insisted to be executed together. And indeed, the soldiers set them both up against a wall and shot them with bursts from automatic rifles. 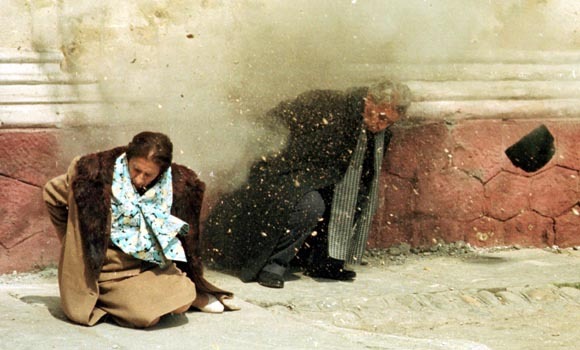 On this day in 1989 the longtime Romanian leader Ceausescu was executed together with his wife. The two of them were arrested three days earlier while trying to escape. They were tried, which lasted about an hour-and-a-half, and this was recorded by a video camera. They were accused of illicit enrichment, the genocide of the Romanian people and a series of other crimes. The verdict was death. The soldiers tied them up and took them out of the trial room. They wanted to execute them one by one, but the couple insisted to be executed together. And indeed, the soldiers set them both up against a wall and shot them with bursts from automatic rifles. Ceausescu supposedly sang “The Internationale” while being led up against the wall. The filming crew did not manage to capture the execution, but they filmed the bodies of the spouses. The footage was sent to foreign TV stations, and was shown on Romanian television later that day.